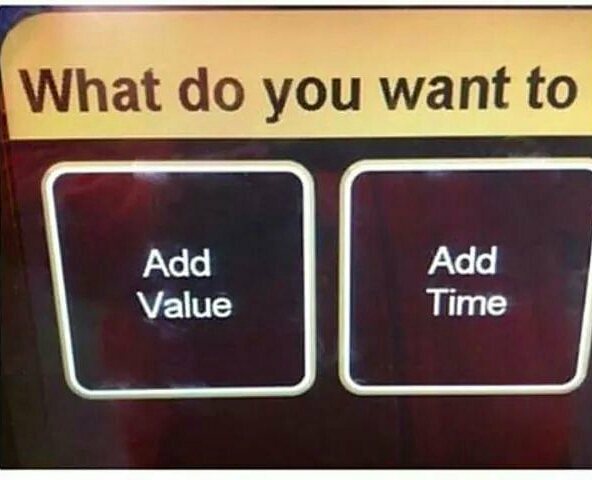 Add Value or Add Time? A Simple Question to Find More Meaning in Your Life. The image stopped me in my tracks, much like a congested station can keep a train stuck in the tunnel for an indeterminable amount of time. Who would have thought the MTA could have asked such a profound question? Suddenly we’re no longer talking about fueling your card with enough of a fare to take the 4 to 59th and Lex. We’re being asked one of life’s most philosophical questions, the ones we tend to encounter when we are recent graduates just starting out and wondering who we’ll become or middle-agers questioning what comes next or those nearing the end of their time on earth. Basically, everyone. What do you want to add? Add value or add time? I noticed any number of things while taking the subway… the frustrated conductors commanding “Stand clear of the doors!,” those early ads for Dr. Zizmore, how men would sit with their legs wide enough to take up two seats, the occasional rat feasting on a discarded slice of pizza on the tracks. I was pick-pocketed once and once only, my first year in the city in what I knew immediately was a classic distraction technique. The thief charged $42 of Chinese food to my credit card before I was able to cancel it. I became a savvy commuter after that, arm protecting my zipped purse, eyes aware but not making contact. I never noticed the kiosk where I’d buy and refill my card asking me this question. Maybe because only now at a turning point in my career and in my life am I considering the importance of it. What do you want to add? Add value or add time? Why do we have to choose one or the other? Can we add more value simply by adding more time? Does time mean more if you are of more value? Like sands through the hourglass, so are the days of our lives, I recall from my teenage soap opera addiction. Who do you want to be? I ask now. How do you want to spend what time you have left? Of what value can I make this life? These days I live two hours from NYC in rural suburbia. I spend a phenomenal amount of time in the car, commuting, chauffeuring, running errands. Yet when I return to the city, I still get asked directions likely because, despite my years away, I walk and talk like a New Yorker – fast. When I’m not walking everywhere, juking around tourists gazing up and texters gazing down, I take mass transit because that’s what you do. Like nearly everything else, the cost of a ride has gone up. I’ll be sure to contemplate my purchase when I refill the Metrocard I still keep in my wallet. And even when I stay in suburbia, I might pull it out just to ask that question. What do I want to add? Add value? Or add time? Both, please. Let’s make this ride we’re on, for however long we are on it, worth it. Now please step away from the doors so the train can leave the station. Valerie Gordon is an award-winning television producer and the founder of Commander-in-She, a career and communications strategy firm. She helps clients harness the power of their stories.